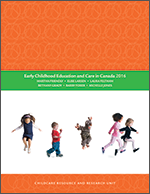 This BRIEFing NOTE situates early learning and child care in Canada in the international context using the work of the OECD's Thematic Review of Early Childhood Education and Care. It first presents an overview of the review's eight year project. Second, it examines the review's final recommendations in Starting Strong II. Third, it presents data from Starting Strong II to situate Canada internationally.